Be inspired by the riding philosophy of â€œlÃ©gÃ¨retÃ©â€œ. 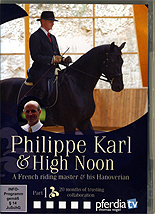 Get close up to the action in Part 1 of this highly instructive documentary film where the young Hanoverian gelding â€œHigh Noonâ€� goes through his first two years of basic training with the renowned French riding master. Philippe Karl trains him on the lunge rein, in hand and in the saddle with respect, esteem and expertise. Enjoy their work together, from young horse to the first piaffe strides, based on trust. Format: DVD - run time 80 mins.